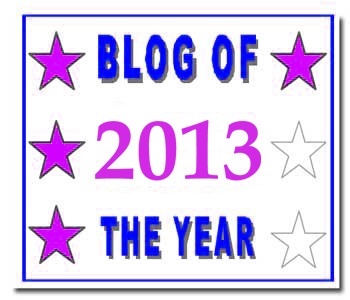 When I started this blog back in July, the last thing I expected was to get the Blog of the Year Award. You can read my acceptance of it here. Of course, back in July I didn’t know this award even existed. When I was nominated in early December I was very happily surprised. Well, color me super surprised that I have been nominated for another, meaning two stars. This nomination came from Shaun at Looking For Reasoning to a Complicated World. If any of you don’t know Shaun or his blog, take my advise and mosey on over. My next unexpected moment was when I got my third nomination and star from Doc Horty Rexach @ It Is What It Is. Please take a moment to check out her blog. She never fails to reveal injustice in the world while at the same time uplifting your spirits. She does her research, and writes intelligent, informative posts always. I came across her blog when I joined Shaun’s Facebook group which I have posted about a couple of times. In case you’ve missed it, ANYONE can join the group, which can be found HERE. Doc is a moderator and is always there to welcome you and to comment on or “like” all of your posts about your posts (ok, I know that sounds funny, but you’ll see). She’s like having your own personal cheering section. Lastly, my jaw-dropping moment came when I received my fourth star, again from Shaun. Shaun has become a true friend over this past month or so. We have chatted and talked by way of Skype. To be honest, the fastest way to forget about my own pain is to have a conversation with Shaun. His lovely Scottish accent combined with his ability to make you laugh, or simply wrap you up in conversation or debate does the job in getting me to forget about my pain, even if for a moment. 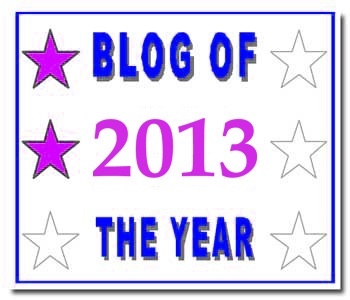 1- Select the blog(s) you think deserve the Blog of The Year 2013 Award. 2- Write a blog post and tell us about the blog(s) you have chosen – there are no minimum or maximum number of blogs required – and ‘present’ the blog(s) with their award. 6- And as a winner of the award – please add a link back to the blog that presented you with this award – and proudly display the award on your blog – and start collecting stars! Since I have procrastinated about accepting these awards and 2013 is over AND because it is seriously a CHORE to do them, I am not going to nominate anyone for this award. Instead, if you are reading this post, YOU are nominated. My New Years gift to you. I hope you enjoy your award, and I hope you enjoy checking out these two great blogs and the Facebook group. You won’t regret it! One award that I need to accept today is the Connection Award. It has taken me a while to accept because dealing with awards is quite the chore for me physically (sitting straight up) and mentally (all the open tabs, links, and notifications all going on at once). If it takes me a while to accept your award, please know that it is not for lack of appreciation, but from lack of energy. This award, the Connection Award, was given to me by Jenn at MyFibrotasticLife.com. Jenn is such a sweetheart and has such a positive outlook on life, that she is truly inspiring to me. We met as followers, moved to a buyer/seller relationship and from there into a friendship. I believe that out of all the awards that I have received, I am most proud of this one since I was the only nominee. A whole post about me. I was surprised and it made quite an impression on my ego! However, I feel that the act of kindness she describes in her nomination post was just something I felt I should do. Nothing special, just me being me and respecting her as a crafter. “After I re-read this post of Jenny’s, I felt connected. I felt I had cried on her shoulder and she was there for me. Sometimes, If you can’t be with some one physically, because they live in another state or country, connecting through real, unbridled blog posts is the next best thing. I am nominating Tammy @ Walk With Me On My Journey Of Illness…. I know when she reads this she is going to have a fit because she is receiving ANOTHER award. However, Tammy is the blogger I feel most connected to. My main illness is “pelvic and abdominal adhesions”. It is a problem that a great many people suffer from, but that is rarely diagnosed. Because of that, it can feel quite lonely sometimes that no one understands the unique sense of pain that they cause. Tammy has been diagnosed with other conditions, but the one she is suffering with the most right now is the adhesions. I know this because she and I have not only become friends, but best friends. I mention her frequently because she has just become that big a part of my life. If I had to choose a post that made me feel the most connected to her, it would probably be Adhesions- The Dark Monster Within, however my connection with her runs much deeper than a single post. I hope she realizes how very much she means to me. 1. Display the Award certificate on your blog. 2. 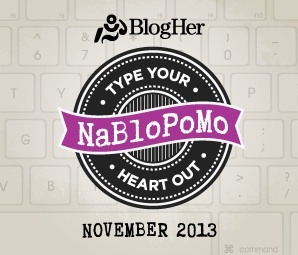 Write a post and link back to the blogger that nominated you. 4. Share three ways that you like to help other people. 5. There is no limit to the number of people that you can nominate. 1. Be there for them when they need someone to talk to. 2. Truly listen as they talk. 3. Give advice only where called for…sometimes people just need a listening ear. 1. Tammy @ Walk with me on my journey of illness to the road of happiness and a life of fulfillment. Tammy’s blog is a no-holds-barred look into the life of an individual with an invisible illness. More specifically, Tammy deals with Fibromyalgia and Adhesions (the same as me) among other illnesses. On her blog you will find poems and prose as she deals with the difficulties of her illnesses and endeavors to overcome them. On a personal note, she has definitely brought light to my darkness by being a friend when I needed one the most. I am proud to consider her my new best friend. We seem to be able to talk for hours about absolutely nothing at all and those talks lend to me forgetting about my pain for a little while. She is truly a gem and I love her dearly. 2. Jenn @ My Fibrotastic Life!. Jenn’s blog is also based mainly on her day to day life with Fibromyalgia. She is very creative and one can find informative posts on how to deal with the symptoms that Fibro can bring with “The Weekly Buzz” and even follow a link to purchase handmade crocheted items through her online store. Jenn’s upbeat attitude could shed light on anyone’s dark world. We have thankfully become friends thanks to WordPress. She has been there for me to help me with my own crocheting (definitely a work in progress!) and to comment on my posts with words of encouragement and understanding. 3. Leslie @ Just Another F-bomb. Leslie’s blog is also deals with an invisible illness, namely Fibromyalgia (bet you couldn’t have guessed lol). On her blog one can find anything from personal experiences to beautiful photographs (Wordless Wednesday). Leslie has become another light on my sometimes dark world. No matter what I’m going through, she always finds the right words to say to make me feel better. She gives great advice, also! 4. PricelessJoy @ Someday I Will Get This Write. My fourth nominee is in name only since she has just recently become an award-free blog. However, she is more than deserving for both of these awards and I felt like she should be mentioned. On her blog one can find humorous stories about her younger years. These stories will definitely put a smile on your face if not make you laugh out loud, hence shedding light on a dark world. PricelessJoy has become a very important person in my life. Although we don’t chat or talk on the phone (why don’t we? ), she has been a huge part of my support system and somehow her mere online presence is enough. If there was any way to be a “nearby friend” to someone who knows how many miles away, she has. Her thoughts and prayers have truly gotten me through some rough patches recently and she absolutely means the world to me. Today has been a yucky, rainy day. However, to brighten my day, I went to church this morning and then figured that after my nap I could work on some of these awards you great people have sent me. So, in this post, I will cover 3 (yes three)! 1. This is the third time I have received The Versatile Blogger Award. Yay me!!! 2. My first pet was a chihuahua named Betty (short for Beethoven…and since she was a girl. No, I didn’t pick out the name 🙂 ). 3. I slept in the bed with my mother until I was 5 yrs. old and decided that I was ready to sleep in my own bed. 4. I was my mother’s only child (and raised as one) but I also have 4 half-sisters and one half-brother. 5. The reason that I was raised as an only child is because the youngest of my half-brother and sisters is 20 years older than me. Yeah, big age difference. 6. One of the aforementioned half-sisters I have only seen twice in my whole life. The second (and third) award that I will be accepting today came to me from Dr. Rex as a “duet award”. The first one is The Imagine Award and the second is the I Am Part Of The WordPress Family Award. *If you decline The Imagine Award, that is okay, but please pass the award to a blog that you find to be very creative. So, I have already written some about Dr. Rex’s blog It Is What It Is. I like that she uses a lot of visual components to her blogs (which I sometimes fall short on). Also, she usually has a piece of music from YouTube to go with her posts. I also like that what she has some elements of love, peace, harmony, or civil rights that underline the majority of her posts (well the ones I’ve seen). Now, instead of choosing 15 for one award, five for the second and 10 for the third (this post has already taken me hours, I have no energy to do such a thing) I am bending the rules a little bit (no surprise, huh?) and only nominating five people. However those five people are nominated for all three awards. So, here they are, my five nominees for these three outstanding awards. I have greatly enjoyed reading all of your blogs and feel you are like family! Congratulations to you all! I have written many times before about the strength of the bonds made by people on WordPress. I was a sad, lonely, misunderstood woman living in chronic pain and without anyone to understand what I was going through. The closest I had was my Ob/Gyn, but you can hardly consider a doctor your friend (not a close friend) because you can’t call them to talk when you’re lonely or write to them to tell someone what’s really going on in your life. Everyone knows that I love owls and wolves. We know that a group of wolves is called a pack, but did you know that a group of owls is called a Parliament? Owls have for centuries been symbols of wisdom and love, and wolves are a symbol of strength, loyalty and family. 2. List a few things that make you a loyal member. 3. Thank the person who nominated you and link back to their blog. 4. Nominate at least five (5) well deserving bloggers whose loyalty and love you value and consider part of your Parliament and Pack; for the Award and let them know the wonderful news by sending them a message on their site. 1) I am always there for a friend when needed. 2) I am loyal and supportive. 3) I am sensitive to other’s needs and know how to listen. The awards keep coming. I never thought when I started this little blog that I would have awards backed up to be received. But since I do, I will accept another one today. I was nominated for the Versatile Blogger Award by Priceless Joy. She has been a wonderful friend to me since we found each other here on WordPress. I am thankful for her help through some really rough spots and I truly believe that her prayers and well-wishes have made me a stronger person. Here are the VBA rules that can be found at versatilebloggeraward.wordpress.com. 2) I was almost done with my third year of college when I had to quit for medical reasons. 3) I speak fluent Spanish. 4) I have only been out of the country one time…I went to Mexico for a month. 5) I would love to visit Europe some day. 7) I have an ISFJ personality type according to http://16personalities.com. and Jenn @ My Fibrotastic Life. Both are excellent blogs about Fibromyalgia and how it affects their lives. I highly recommend these blogs, even if you don’t suffer from Fibromyalgia. 1) I love to sing. I was in choir in Junior and Senior High School. At that time I could sing really well, but that was before the tracheotomy. I still love to sing and when I feel like singing I sing…if you don’t like it, don’t listen! 2) My first job was as a nail technician. I interned until I completed the necessary hours to get my license, then I worked doing nails. I got as far as Master Manicurist in my almost 8 years at this job. 3) one of my favorite channels is the Food Network Channel. I love cooking when I’m able to do so. 4) I rarely wear blue jeans anymore. I’m usually in Yoga, pajama, or sweat pants. 5) When I do dress up, my favorite pair of shoes is a pair of leopard-print heels. My second favorite pair are lime green heels. 6) My middle name is Elizabeth. I was named Elizabeth after my grandmother. 7) I married my first husband at 19. Yes…young and stupid…enough said. One positive thing I got out of my first marriage: Gastric Bypass surgery. As far as nominees go, I don’t believe I can come up with 15, especially not counting these two beautiful ladies. I could only come up with 9. Thanks to Julie @ The Nocturnal Laundress, I. 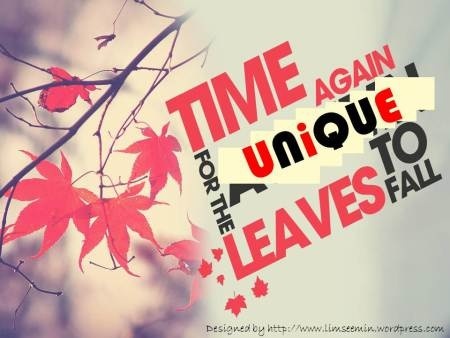 Have been nominated for the Unique Leaves Award. I am honored to be nominated for another award, and especially one so, well, unique ;). 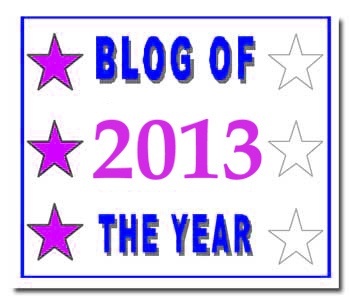 1) Display the award logo in your blog. 2) Link back to the person who nominated you. 3) Tell us how you and your blog are unique. 4) What are your thoughts about being unique? 5) Nominate 10 others blogger for this award and link to them. 6) Notify those bloggers for the nomination. Rules 1 & 2, check. Rule #3: Tell us how you and your blog are unique. My blog is unique because I put my heart and soul into it. Many of my posts were written with tears rolling down my face as my emotion poured out into the writing. I may say a little too much at times, but I feel that in order to help others the most, I have to be transparent. Rule #4: What are your thoughts about being unique? I think that we are all unique in our own ways. That’s what makes us different…special. It is a humbling thought that nowhere in the world is another person just like you nor will there ever be one. You have to make your mark somehow…this is how I’ve chosen to make mine. Again, thank you Julie for the award. I will proudly add it to my wall.